Before you spend much time editing your images in Photoshop Elements, you should know how to create a backup of your photo catalogs. If you spend sufficient time working on a project and it gets to the point where redoing your work would be a major aggravation, it’s time to back up files. In Organizer, choose File→Backup Catalog to CD, DVD or Hard Drive. 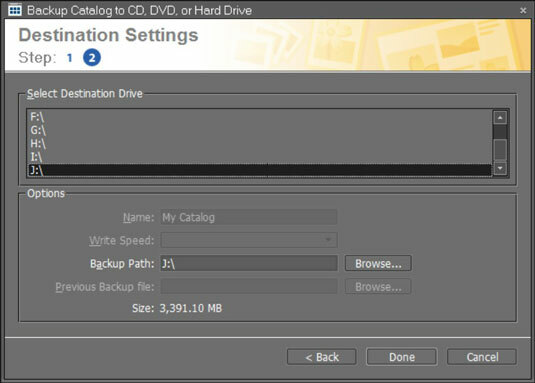 The Backup Catalog to CD, DVD or Hard Drive Wizard opens. This wizard has three panes that Elements walks you through to painlessly create a backup of your files. Select the source to back up. Full Backup: Click this radio button to perform your first backup or write files to a new media source. Incremental Backup: Use this option if you’ve already performed at least one backup and you want to update the backed-up files. Click Next and select a target location for your backed-up files. Active drives, including CD/DVD drives attached to your computer, appear in the Select Destination Drive list. Select a drive, and Elements automatically assesses the write speed and identifies a previous backup file if one was created. The total size of the files to copy is reported in the wizard. This information is helpful so that you know whether more than one CD or DVD is needed to complete the backup. The wizard provides options for selecting the destination media for the backup. If you intend to copy files to your hard drive or to another hard drive attached to your computer, click the Browse button and identify the path. If you use a media source, such as a CD or DVD, Elements prompts you to insert a disc and readies the media for writing. Click Done, and the backup commences. Be certain to not interrupt the backup. It might take some time, so just let Elements work away until you’re notified that the backup is complete.